The 32 Observations series is back, with Mark Chichester finding an interesting piece of information about all 32 teams after two weeks of football. If you would like to make some observations of your own, you can do so with PFF Elite, where you can find several signature statistics for every offensive and defensive position in football, thanks to Premium Stats 2.0. Buffalo Bills: Through two games of the 2018 season, rookie quarterback Josh Allen has tallied an 11.8 passer rating on throws under pressure. This is the lowest rating by a rookie quarterback in the first two games since Matt Ryan in 2008. Miami Dolphins: Offensive tackle Ja’Wuan James is one of just six offensive tackles in the NFL that have played more than 55 pass-blocking snaps and not lost a single block. New England Patriots: The Patriots defense has produced 41 quarterback hurries on their pass-defense snaps so far this season, the most ever recorded by a defense through two games. New York Jets: Running back Isaiah Crowell has averaged 5.77 yards after contact per attempt through two weeks, which is the best mark among running backs. Baltimore Ravens: Linebacker Kenny Young has logged five tackles for loss or no gain so far this season, which is tied with Pittsburgh’s Vince Williams for the most among linebackers. Cincinnati Bengals: At this point last year, cornerback William Jackson was buried on the Bengals depth chart and played just 12 coverage snaps in the first two games. This year, he’s already played 116 coverage snaps, which is tied for the most ever played by a cornerback through the first two games. Cleveland Browns: Quarterback Tyrod Taylor has moved off his spot on 10 of his 58 dropbacks that were kept clean from pressure, the most among the league’s signal-callers so far. 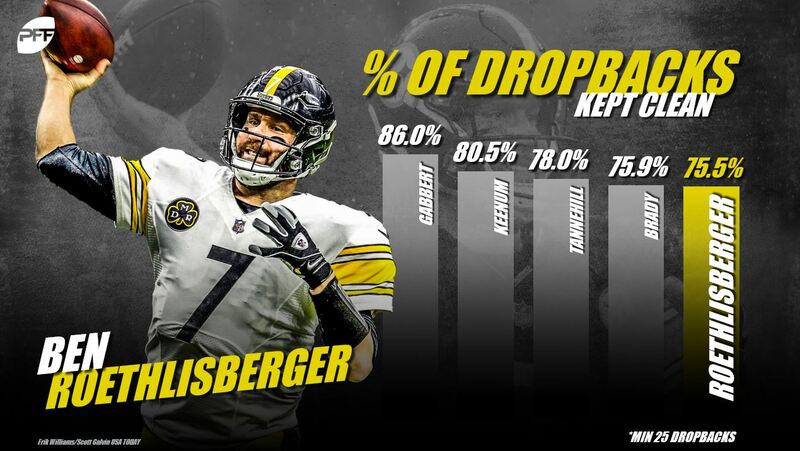 Pittsburgh Steelers: Quarterback Ben Roethlisberger has logged 110 dropbacks over the first two weeks of the season, which is the most ever recorded by a quarterback in the first two weeks. Houston Texans: Quarterback Deshaun Watson has averaged 3.48 seconds in time in pocket so far in 2018. This is the longest time we’ve ever recorded in the first two weeks of a season. Indianapolis Colts: Through two weeks, quarterback Andrew Luck‘s average depth of target sits at a lowly 5.0 yards downfield. This is the lowest mark among quarterbacks this season and tied for the fourth-lowest depth of target we’ve ever recorded in the first two games. Jacksonville Jaguars: So far this season, safety Barry Church is the only safety in the NFL who has logged two tackles for loss when defending in the red zone. Tennessee Titans: Through two games, cornerback Malcolm Butler has allowed 257 yards on throws into his primary coverage and an average of 3.78 yards per coverage snap, both of which are the fourth-worst marks ever recorded by a cornerback with at least 50 coverage snaps through two games. Denver Broncos: Rookie edge defender Bradley Chubb has produced eight total quarterback pressures so far this season, and has won 20.4 percent of his pass-rush snaps, which is the fourth-best rate ever recorded by a rookie edge defender in the first two games. 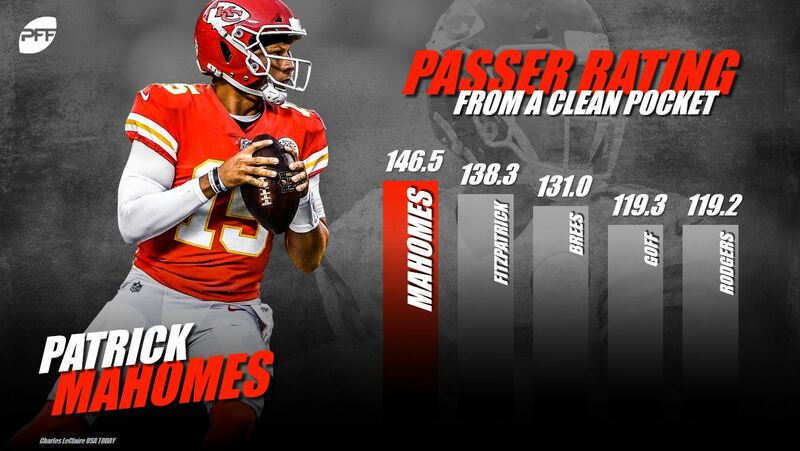 Kansas City Chiefs: So far, quarterback Patrick Mahomes has a passer rating of 146.5 on throws from a clean pocket, which is the best mark among quarterbacks this season and the sixth-best rating ever recorded by a quarterback in the first two weeks. Los Angeles Chargers: In two games, quarterback Philip Rivers has produced a passer rating of 138.9 on his attempts inside his opponents 20-yard line, which ranks first among all quarterbacks with at least 10 attempts. Oakland Raiders: Through two weeks, 66.7 percent of quarterback Derek Carr‘s pass attempts have been thrown short of the first down marker. This is highest-rate among quarterbacks this year and the sixth-worst rate ever recorded by a quarterback through the first two weeks of a season. Dallas Cowboys: The Cowboys defense has accumulated 30 defensive stops in the passing game so far this year, which is the second-most ever recorded by a team in the first two weeks of a season since 2006. New York Giants: Quarterback Eli Manning has logged an adjusted completion percentage of 90.5 percent of his third-down attempts this year, which is tied for the best mark ever recorded after the opening two games. While that may sound impressive, it’s worth noting that his average depth of third-down pass currently sits at 4.6 yards downfield, which is also the lowest mark we’ve ever seen through the first two weeks. 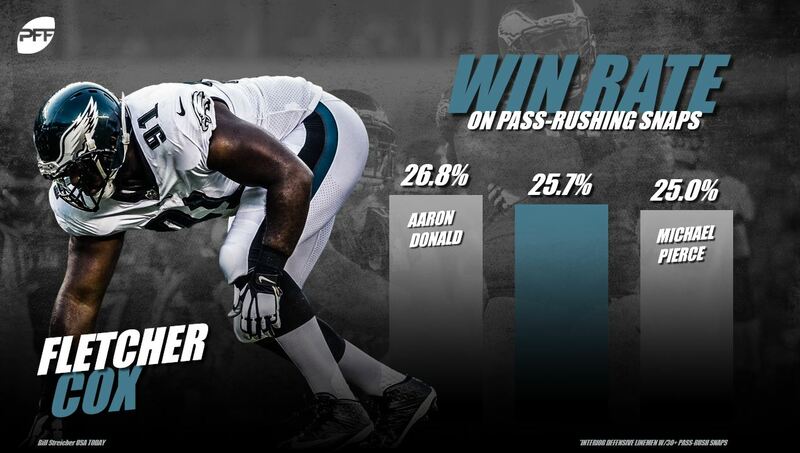 Philadelphia Eagles: Fletcher Cox has won 25.7 percent of his pass-rushing matchups this year, which is the second-best rate among interior defensive linemen. Chicago Bears: The Bears offensive line have allowed just two quarterback pressures on third down so far this year, which is tied with the Titans and the Buccaneers for the best mark in the league. Detroit Lions: Rookie guard Frank Ragnow has allowed 13 total quarterback pressures so far this season, the most ever recorded by an offensive guard in the first two weeks of a season. Green Bay Packers: Randall Cobb is averaging a whopping 4.91 yards per route run on third downs this year, which is the best mark among wide receivers with at least 20 third down snaps. Minnesota Vikings: Running back Dalvin Cook has already forced 10 missed tackles as a rusher this year. So far, he’s averaging 0.38 missed tackles per attempt, the seventh-best mark ever recorded by a running back in the first two weeks. Atlanta Falcons: Cornerback Robert Alford has broken up five passes so far this season, which is tied for the second-most ever recorded by a cornerback in the first two games of a season. Carolina Panthers: Through two weeks, running back Christian McCaffrey has logged 20 receptions in the passing game. This is the most ever recorded by a running back in the first two games of a season, and tied for the fourth-most ever recorded by a skill position player. 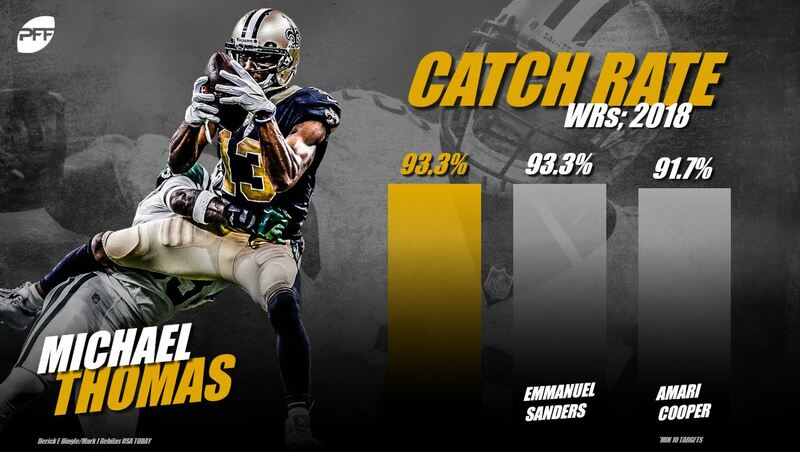 New Orleans Saints: Wide receiver Michael Thomas has been targeted a whopping 30 times through two weeks, which is second to only Antonio Brown (32) this year and tied for the fourth-most ever recorded through the first two weeks of the season. His 28 receptions are the most ever recorded by a pass-catcher in the first two games. Tampa Bay Buccaneers: Wide receiver DeSean Jackson is averaging an absurd 7.64 yards per route run so far this year, which is the best mark ever recorded after the first two games of a season. Arizona Cardinals: The Cardinals offense is averaging just 0.76 yards per route run so far this season, the lowest mark ever recorded after the first two weeks of a season. Los Angeles Rams: Aaron Donald has already produced five total pressures on third down this year, the second-most among interior defensive linemen. Since 2016, Donald has racked up 74 total quarterback pressures on third down, three more than the next closest defender (Von Miller). San Francisco 49ers: Running back Matt Breida has racked up 114 rushing yards from breakaway runs (runs of 15-plus yards) through two weeks, which is the best mark among running backs. Seattle Seahawks: Through two weeks, punter Michael Dickson is averaging 47.9 net yards per punt attempt. This is the third-best mark ever recorded by a punter in the first two weeks of a season.